Occasionally, I get an opportunity to do something that most people don't normally get to do; often, it's something that most people probably shouldn't be doing. 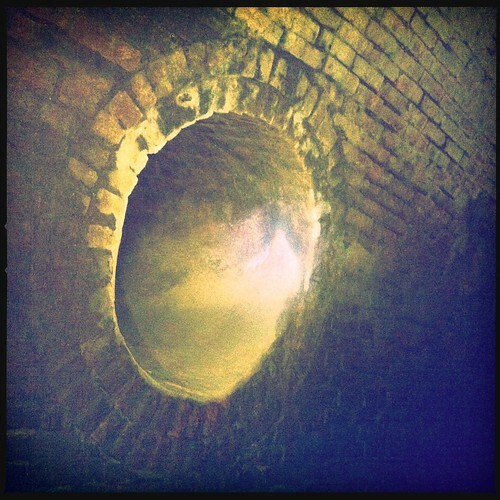 Yesterday was one of those occasions: my friend (and amazing local historian) Jimmy O. offered to take me on a field trip into the storm drains below the city. As I was driving to meet Jimmy O., I had that weird feeling in my gut that I always get before I go do something like walking into a storm drain or using a sidewalk on an interstate bridge or saying yes to an impulsive midnight trip to Tunica. It's a weird hybrid of thoughts, both "This is going to be the best time ever!" and "I should probably have called someone or left a note or something so that they'll know where to find the body." Before we get any further into this, I need to make something very, very clear. Do not attempt this. Don't get in a storm drain. This might sound pretty cool, but you very much don't want to do this. It's dark, it's dangerous if conditions aren't exactly perfect, and it's easy to get lost. To further discourage you, I'm not going to tell you where the tunnels are, so don't ask. To get to the easiest point of entry, we walked a few blocks to a water retention area with a large drainage culvert. Jimmy dropped a ladder into the culvert and shimmied down the retention wall into the ditch so that he could spot me. If I had to pick a scariest part of my trip into the ditches, trying to hold myself up with my arms and stomach on the grass while my feet dangled down an eight foot wall to try to find a five foot ladder would be it. Once we were all safely in the ditch, we started walking towards the drains. 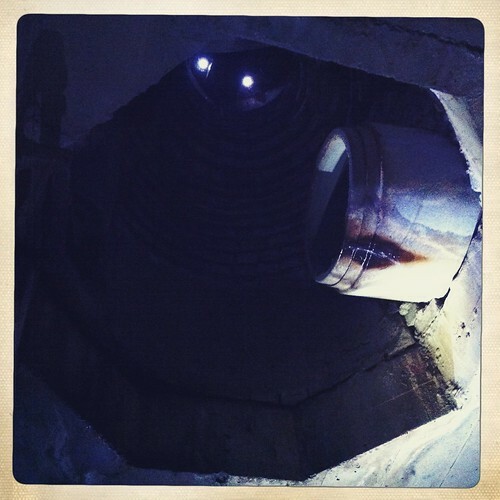 There were three entrances to the tunnels, and Jimmy said that after a little trial and error, he finally found the one that offered the best passage under downtown. It took about 10 minutes for my eyes to adjust to the darkness, but I never quite got used to the sounds. Since we were in a drainage ditch, there was a constant water drip noise. Our voices echoed, and occasionally, a car would drive over a manhole on the street above, causing a loud, dull metalic popping sound. I recorded a few seconds of what it sounded like when we first walked into the tunnels. Take a listen. Walking into anything so bleak and dark and unknown is terrifying, but after a few minutes I got comfortable enough to think about looking around. I'm not sure what I was scared of – there wasn't anyone else down there (save for some of the biggest cockroaches I've ever seen). The walk wasn't that difficult once I figured it out. There's always a decently fast moving river of water running through the drains, but it hadn't rained in so long that there was plenty of dry concrete. There were places where years of water drips had formed stalagtites and stalagmites (just like in a cave) and years of bricks, pieces of metal and rocks all fused together on the tunnel floors by time and water. 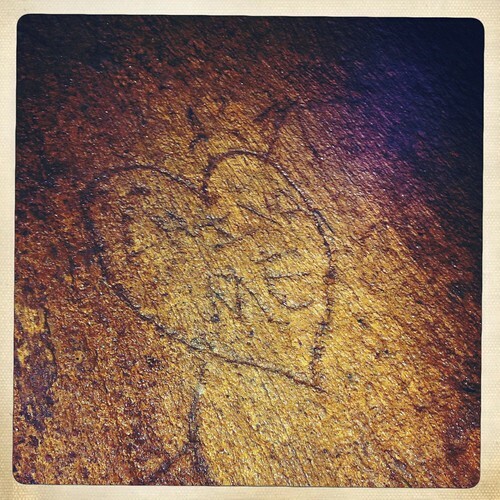 The only graffiti that we saw was a single heart with a pair of initials, etched into the concrete where it would be guranteed that exactly no one would ever find out about their love. This might sound a little disappointing, but there's not much down there. 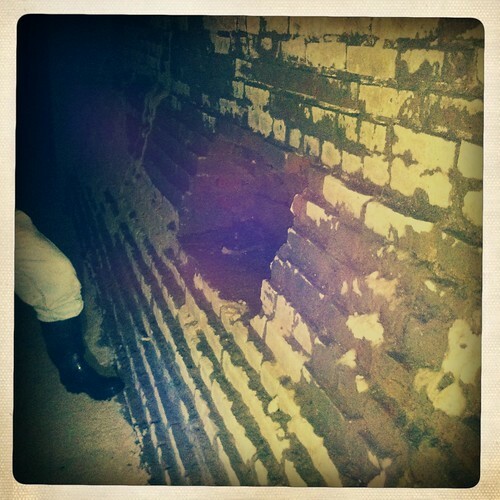 We trekked through yards and yards of square concrete tunnels built in the 1930s that would occasionally open into huge, rounded catacomb-like brick walled rooms that were sections of the drainage system remaining from the late 19th century. And lest you forget how dangerous these drains can be when they fill up with water, Jimmy O. constantly pointed out pieces of trash carried by the rushing water that had been caught on the rebar on the tunnels' ceilings. We walked about a mile underground until we got to the manhole that Jimmy had identified as the best exit point. 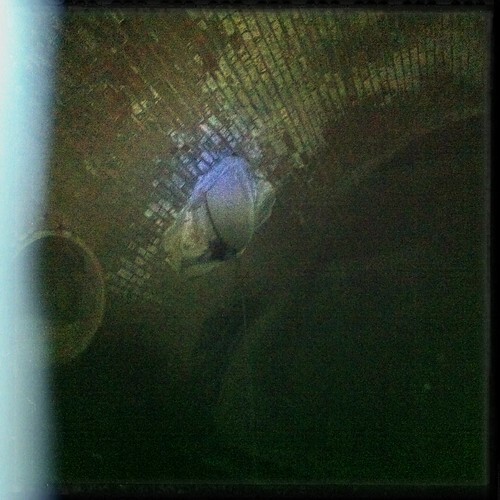 Getting out of the tunnels was significantly easier than getting in – we crawled up a round pipe, then shoved our backpacks through a storm drain and popped out of a manhole. The best part of climing out of the manhole was that there was a standing on the sidewalk across the street, watching three people (one of whom was dressed like an extra from "There Will Be Blood") popping out of the sidewalks like there was no big deal. There are no public tours through the storm drains (so again, don't ask), but Jimmy Ogle gives plenty of other amazing historical walking tours of Memphis, including one entirely devoted to manhole covers. For more on his tours, go here. Thanks for making me sufficiently jealous! There are other drainage ditch systems in town that are saturated with graffiti. Kerry, you might be surprised but both Mayors Wharton and Luttrell and about every government agency there is are now very familiar with the Hurricane Creek tunnel which passes directly below the Memphis Airport and Runway 9/27. I've been trying for years to get the Memphis Airport Authority to repair the damaged tunnel. Here's some good photos and video of the tunnel. Awesome blog by the way. I spent many many hours in the drainage ditches of midtown as a kid. My friends used to sneak into the zoo that way, it required running across the flamingo yard. There is alot of fencing around there now, so I don't think that trick works as well these days. Ditches ranked just under trains and just above the IC belfry as sources of mischief in my childhood. Also, overton had a dirt pile on the trail for years that made a (~3 foot) 'dukes of hazard' ramp that was perfect for breaking your bike tires (or arm) on. Also, it is important to note that those ditches are amazingly dangerous, exponentially moreso than even a partially demolished building with walls sagging off the edges. Even the people that work in them, don't spend any longer than they need to. Great piece. Would like to see Underground Memphis store fronts too. 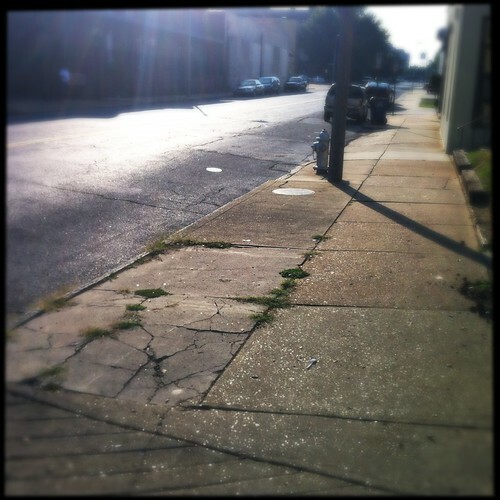 Thank you, I love the history of Memphis and there is a lot to be uncovered ….